﻿ Ilha do Guajiru - Brazil's kiteboarding paradise! • beachlife opening new office! • POWER INSTALLED ENTIRE ISLAND! • land prices rising 2 digits! • Praia Limpa 2012 Award! • Report & photo's Race & Party! • Round the island Race & Party! • Strong Winds Party big success! • Strong Winds party October! • Ilha world's 3rd windiest spot! • Impressive changes since 2008! • Crazy (wave) spot discovered! • Designs area 1200 ready! • Sky high website hits! • Island movie coming out! A discovery off Brazil’s Atlantic coast could prove to be the world’s third-largest oil field, the director of Brazil’s National Oil Agency said. The Carioca field in the Santos Basin off the coast of Sao Paulo state has estimated reserves of 33 billion barrels, Haroldo Lima said on Monday. “It could be the world’s biggest discovery in the past 30 years,” he said. Brazil’s state oil company, Petrobras, which controls 45 percent of the field, said in a statement that the exact size of the find would be announced in the coming days after further studies were done. Petrobras engineers said they could not yet say whether extraction would be profitable. Nevertheless, Petrobras stock rose 5.6 percent, closing at 82.97 reals (US$49.18), after surging as high as 7.7 percent in Sao Paulo. Lima said that while his information was from Petrobras, it was “unofficial.” Brazilian Energy Minister Edison Labao advised waiting for the official disclosure. If Lima’s estimates are correct, however, Carioca would rank behind Saudi Arabia’s Ghawar oil field and Kuwait’s Burgan field in size. Carioca lies about 5,000m deep under a thick layer of salt. The remaining interests in the field are held by British Gas at 30 percent and Spain’s Repsol at 25 percent. If Lima’s announcement proves correct, Carioca would be at least four times larger that the Tupi field discovered in November, also in the Santos Basin. That field, of which Petrobras holds 65 percent, is believed to have oil and gas reserves of 5 billion to 8 billion barrels. Extraction could begin at the earliest there in four or five years, experts said. Petrobras’ production is 1.9 million barrels per day, while its estimated reserves are 13 billion barrels. 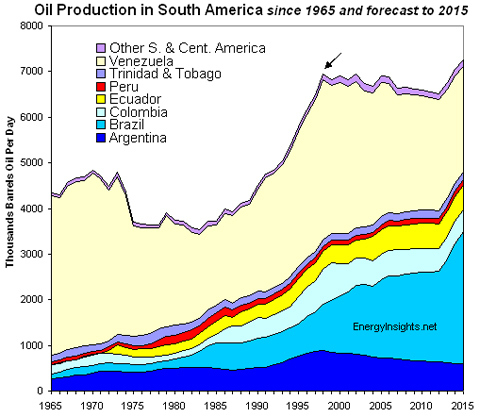 Brazil ranks 17th among the countries with the largest oil reserves.